Seriously, when we talked about fried chicken, the first immediate thought is Colonel Sanders' infamous KFC chicken. 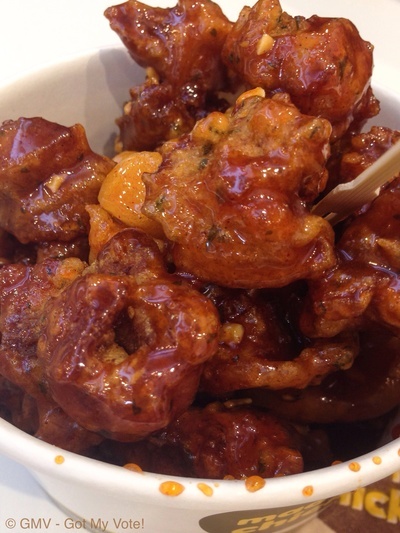 Today, I am going to introduce another highly morish snack also colloquially known as KFC - Korean Fried Chicken. 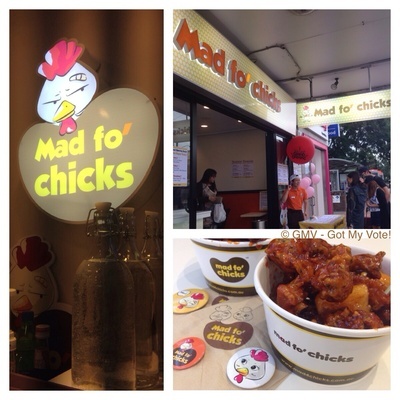 It is the first grand opening week for a newly established Korean Snack Shop - Mad fo' Chicks in Eastwood. Party balloons and banners were all over the place to mark their opening celebration. 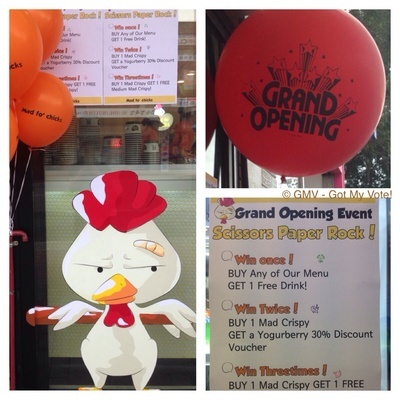 We were attracted to their special promotion event, where you play paper, rock and scissors with the game host, with a chance to win something! Win Three Times - Buy one and get one free! Now doesn't that sounds like a guaranteed win? I wish casinos would adopt the same gaming policy. We queued up and tried our luck. Lady Luck must have been on our side, and we had three consecutive wins. So we got the buy 1 and get 1 free! It is a clean and modern little snack shop. 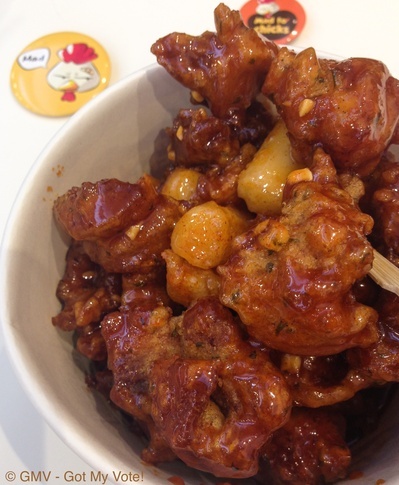 We watched staff in orange uniform tossing and stirring crispy fried chicken in a reddish sticky sauce. They also mixed in the Korean rice cake sticks too. There are three level of spiciness: Original, Mild and Hot. From experience, we know the Koreans like their food hot, and their spice tolerance is very high. 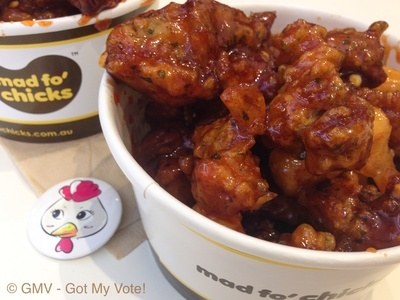 We were too chicken (no pun intended), so we opted for the original option. They are also giving these adorable badges away. 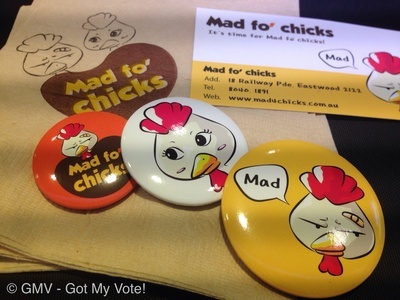 The mad chick logos are distinctive. Children will go mad for these. Our premium mad crispy chicken medium tubs came to $10.00. Be warned, these boneless chicken fillets are highly addictive. Too bad, Mad fo' Chicks don't have a liquor licence. An icy cold beer would go so nicely with these naughty morsels. They also sell Tornado Chips which is like chips on sticks. 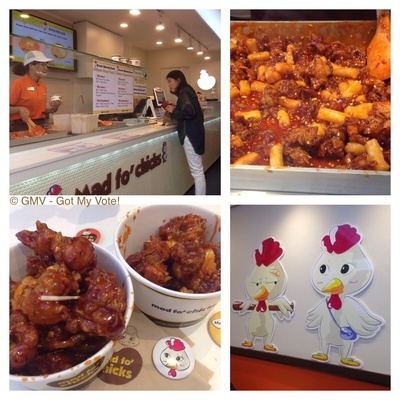 I would love to try it, but they sold out at the time I visited this Korean chicken paradise. The coating is not very crisp, mainly because they were all coated in the red Korean sweet sticky sauce. I think they also fried the rice cake sticks because they tasted slightly gritty. I found the ratio of batter to chicken fillet to be quite high. This is definitely not your most healthiest meal. I gave my friend the complementary tub of Korean Fried Chicken. She loved it so much, and I believe she will become a loyal devotee to Mad fo' Chicks. It was a fun way to spend an afternoon. The snack shop is conveniently located right next to Eastwood Train Station, of which is good for grab and go purposes. It will be a popular snack bar, esspecially in the colder weathers. Be Mad. Give the Chicks a try. I tried this fried chicken place and really liked it :) I thought the ade drinks were cute and presented nicely but a little overpriced though.